At Andrew Batey and Sons, we understand the importance of first impressions. And that’s no more important than for B&B owners. With so many review sites, and even programmes such as “Four in a Bed,” these days every detail matters. From the corner fold on the toilet paper, to the mint on the pillow, to that flaky paint you meant to deal with during the November slump, your customers notice everything. But there’s still time to get your B&B in tip-top shape before the forthcoming peak season. So if your B&B needs a quick refresh or perhaps a new look, give us a call. 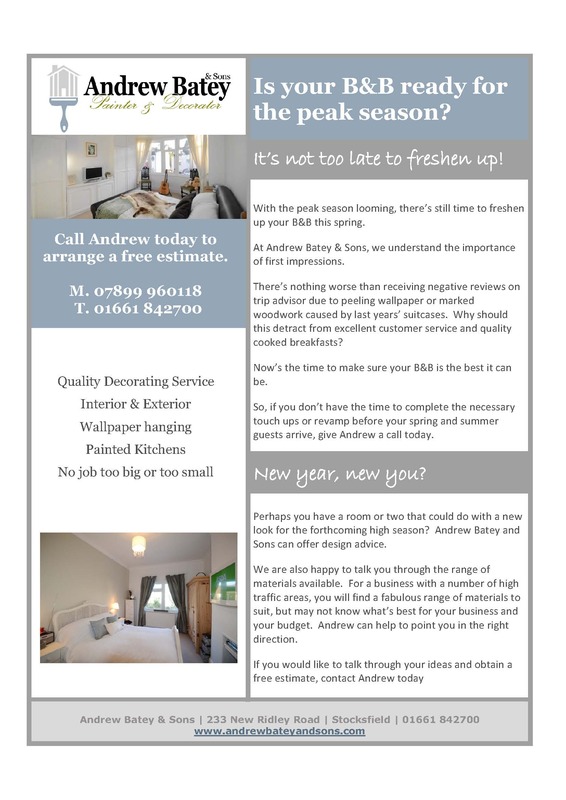 This entry was posted in Services and tagged andrew batey and sons, B&B Decoration, B&B Decorator Northumberland, B&B Maintenance, decorator in northumberland, decorator in stocksfield, painter corbridge, painter decorator corbridge, painter decorator hexham, painter northumberland.